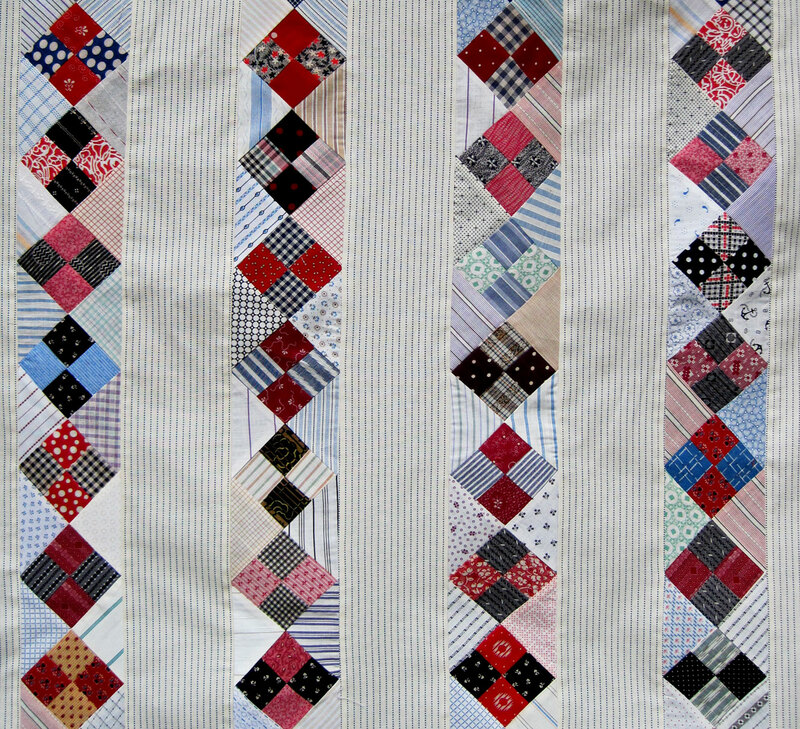 The little twin quilt tops were stitched up pretty quickly since I was able to use speed piecing. I am not usually able to avail myself of these time-saving techniques since I am normally working with small scraps of vintage fabric. The process for making 4 Flying Geese was new to me — whoever figured that out is very clever. 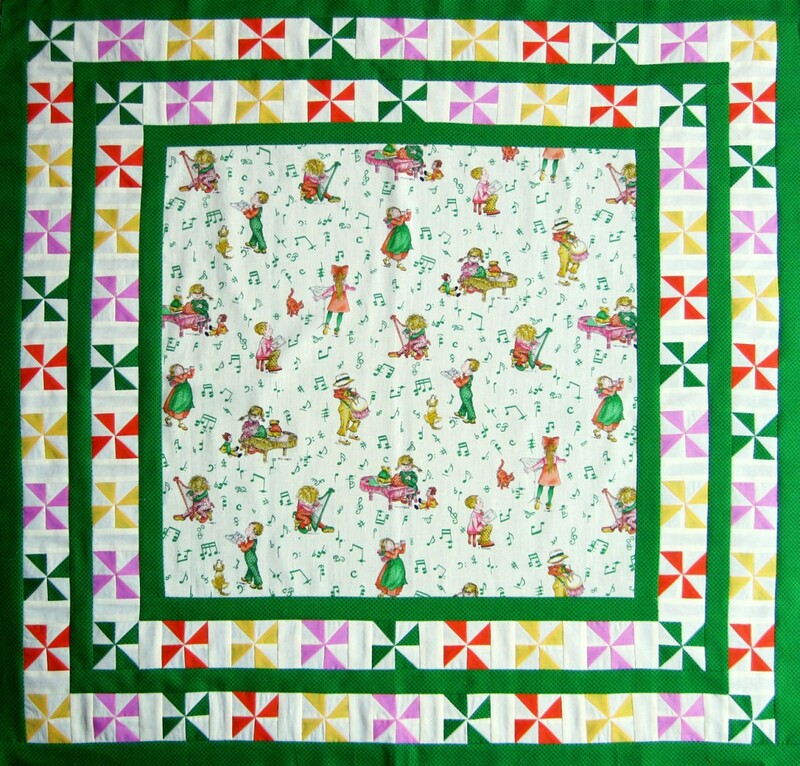 The tops look about like I expected, although looking at the photos now, I wish I had moved the position of the green Flying Geese blocks so the long edge of the triangle was not right up against the green border. 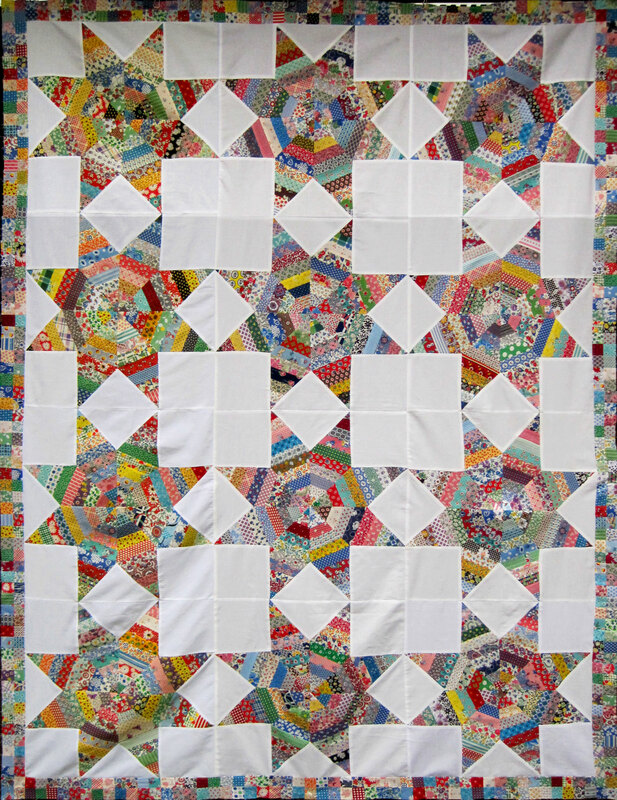 Oh well….it’s one of those stupid things that probably nobody else would notice (unless they were also a quilter). The quilting on these will be pretty simple. 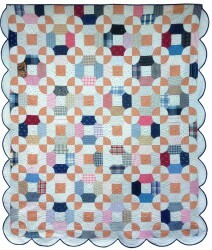 I am thinking of machine stitching the blocks in the ditch and hand quilting a grid in the center. Now I just have to find something good for the back. The pale yellow background fabric would have been nice, but I don’t think I have enough. Looks like I’ll be taking another trip to the fabric store. Our wonderful music teacher, Pam, is pregnant with twin girls. Although I’ve made lots of baby quilts for teachers at school and family members, these are my very first twins. Pam and her husband are both music teachers, so when their son Collin was born, I wanted to use a music theme for his quilt. Unfortunately I couldn’t find any fabric that I liked, so he ended up with an Around The World quilt made with 1930s reproduction fabrics. It was cute, but not musical. 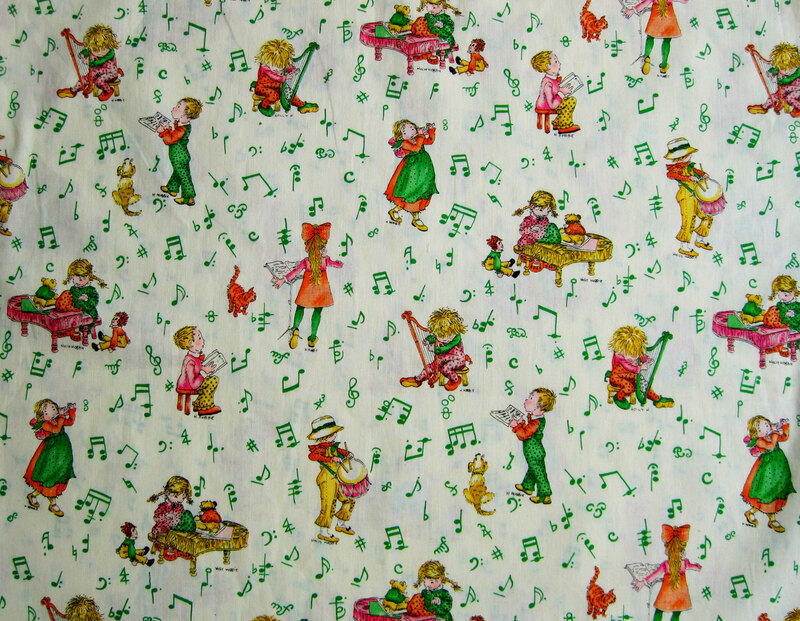 This time I searched on ebay and found this 22″ length of vintage Holly Hobbie fabric. All the figures are doing something musical and there are music notes in the background — it was perfect! When the remnant arrived in the mail, I was surprised that it was brighter than the ebay photo — the background is a soft yellow, but the other colors are bright 1970s shades and definitely out of my comfort zone, but still pretty adorable. Not wanting to cut into the cute print, I decided to design the quilt with the HH fabric in the middle and blocks around the outside. I also wanted each little girl’s quilt to be different, but similar. 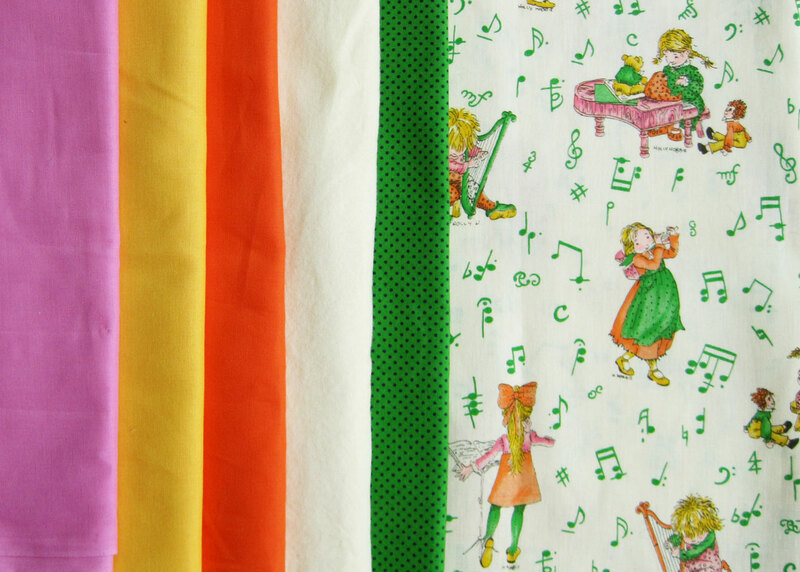 Because the HH fabric is busy, I thought the blocks should be simple — the colors will be solids, with the exception of the green polka-dot fabric. 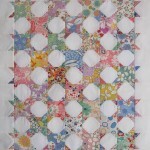 Last night and all morning today I worked on designs for the quilts. 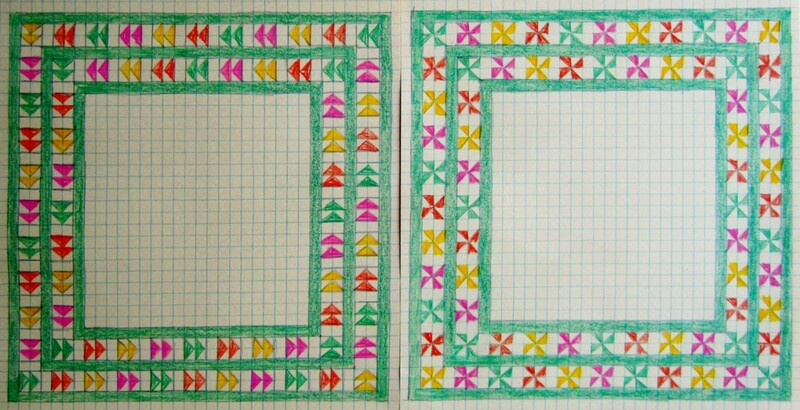 Each square is 1″, so these will be little infant blankets (like Collin’s) — something a baby can lie on, and also carry around when they’re a toddler. I’m really happy with the way the final designs look (there were lots of drafts), and now I’m excited to start stitching them up. 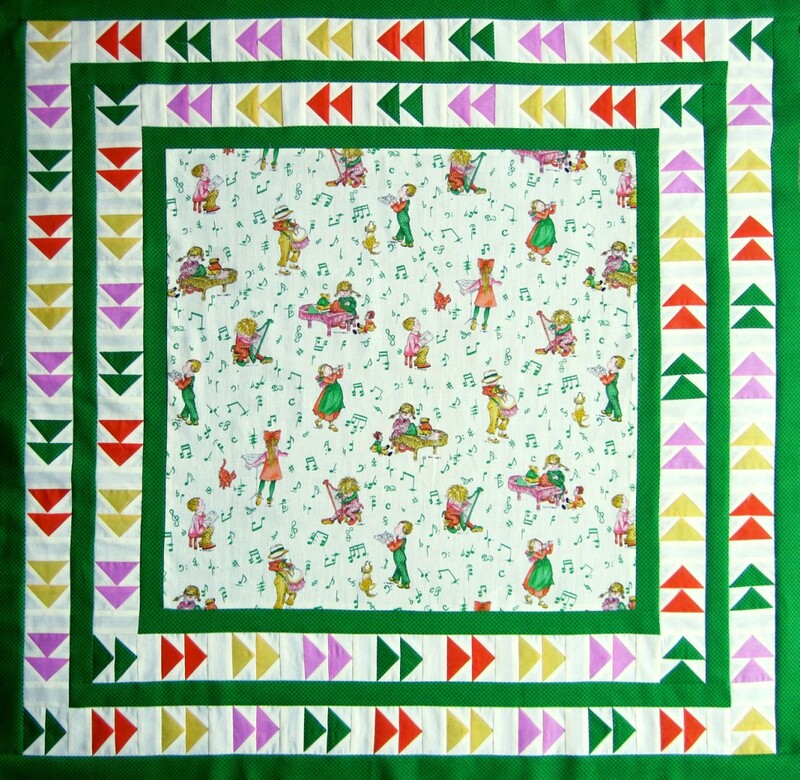 This top was made with a box full of quilt scraps from the 1940s and 50s. 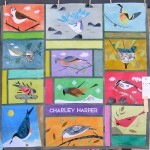 All of the pieces were 1 1/2″ wide in varying lengths, but none longer than about 15″. 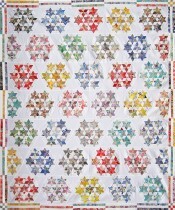 I thought perhaps the quilter had planned to make a log cabin quilt, but most of the color values were the same. 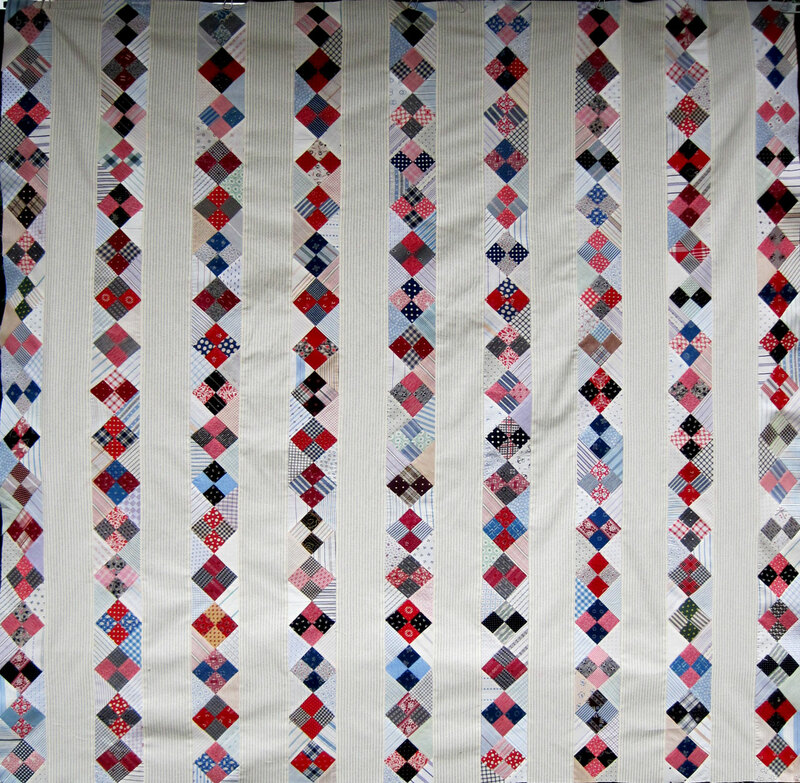 My other thought was a string quilt of some kind, which seemed to work better with the fabrics. I didn’t use a foundation, but just eyeballed the strips and cut them to fit my big diamond template. They don’t match up perfectly (and I don’t think they need to), but they are fairly close since all the strips were the same width. I used all of her scraps and had to add a few of my own, some of which were newer fabrics. For the border, I used the little leftover ends of the strips. I made this top a long time ago, and I’m not sure why it ended up at the bottom of the pile. I think it will be fun to quilt a nice wreath or something fairly elaborate in those white spaces. 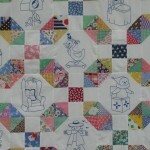 This is the second quilt I am making from an antique one-patch top that I took apart — here is the first one. 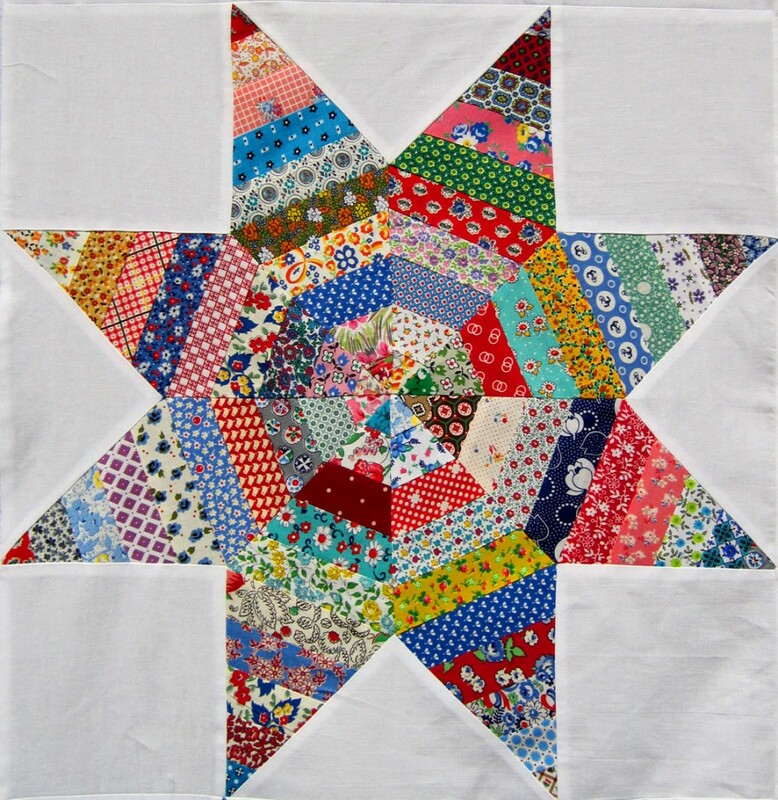 The four-patches are from the antique top, the setting triangles are a combination of antique and vintage scraps, plus some new fabrics. 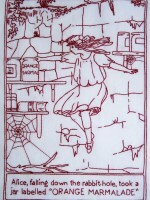 The vertical sashing is a reproduction print. This is another throw for our family room — replacing the fleece we’ve been using for years. This is the third time I’ve made a quilt using this pattern — the previous two were baby quilts for teachers at work (one I posted here). It’s an easy pattern and can have so many different looks depending upon the fabrics you select. 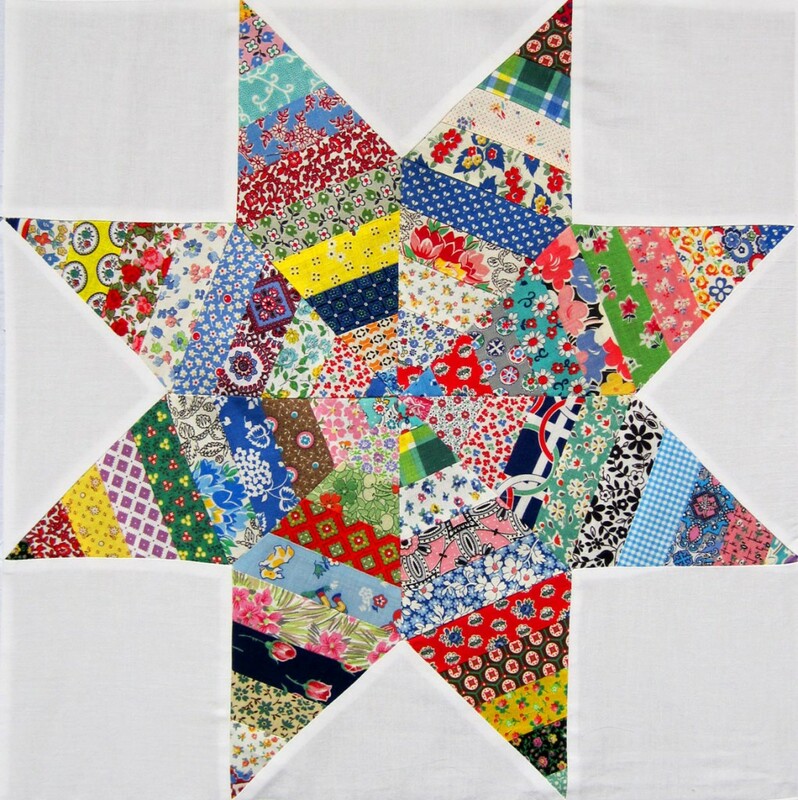 I don’t like to overplan this type of quilt, because it’s a lot more fun to just grab a block and a couple of setting triangles without giving too much thought to colors and patterns. It’s always surprising to me how well they turn out. 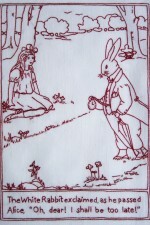 It’s been quite awhile since I posted an Alice block. I have so many different projects going on right now, it doesn’t seem like much progress is being made on any of them. Thankfully, Alice’s face on this block went pretty smoothly and I didn’t have to do the normal unpicking and re-stitching. 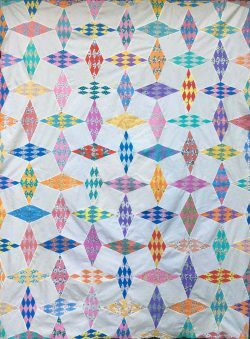 I am still thinking of using an alternate pieced block, but I haven’t decided on a pattern yet — it’s much harder to design a quilt with rectangular blocks. 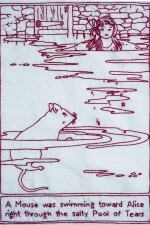 This is my favorite type of embroidery — outline stitch with one stand of floss and a complex design. 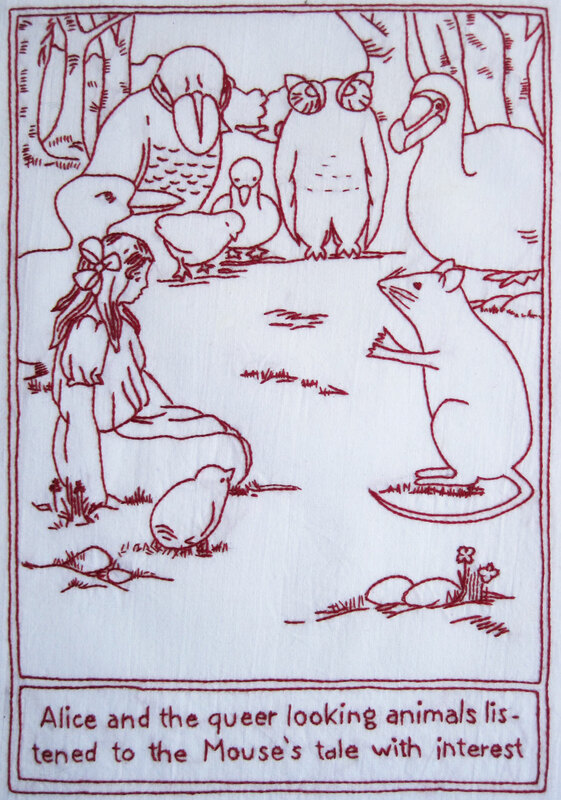 Vintage children’s book illustrations are my favorite source of designs. Although I love collecting and sharing vintage transfers and embroidery patterns, for some strange reason I rarely use them in my own work.